Brownbag: Where is the power? Heidi Busse, postdoctoral research associate with the Center for Community and Nonprofit Studies, shares lessons using participatory methods to understand how socio-ecological factors influence diets and food environments in rural Ethiopia, and implications for the design and evaluation of multi-level, multisector nutrition interventions. 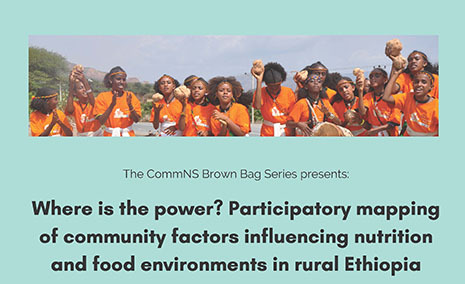 The Brownbag Series provides a platform for students, researchers and nonprofit professionals to exchange ideas and improve skills in research and practice.